Tuesday could turn out to be a great day for Verizon Communications Inc. (NYSE: VZ). After announcing its $4.4 billion acquisition of AOL, Inc. (NYSE: AOL) in the morning, the Wall Street Journal reported that U.S. regulator are unlikely to block its acquisition of DIRECTV (NASDAQ: DTV). Craig Moffett, Moffett-Nathanson analyst, was on CNBC to discuss why the DIRECTV deal matters more for Verizon than AOL deal and what value will AOL be providing the company. “And if you're thinking about how do I actually monetize my wireless platform, the answer is probably not just driving usage from subscribers because they have been doing that for a long time and it hasn’t generated any extra revenue, it’s probably finding a way to monetize through advertising." 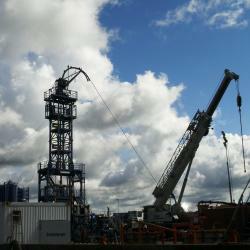 Is The Shale Oil Market Recovering?